We lay some ground work, mostly on the question of faith and reason. This is a big stumbling block these days. We all know that the role of science is to systematically determine the nature of the world and we tend to look to religion for belief, as though the two were separate. Yet faith isn’t about believing crazy stuff and reason can’t be reduced to mere logic. And we clear up some misconceptions about God (how he’s probably not really an old guy with a big white beard). Then we take the plunge into the thought of Aquinas (see the Outline) and spend the rest of the time exploring that thought and how it answers key questions about the purpose of life, goodness, happiness, and why we exist. If you don't know why we exist, join the club. Aquinas has no idea why we exist either, but he makes the mystery of existence the starting point of his thought, creating a lovely common ground for believers and non-believers alike. Aquinas applied reason to the evidence of his senses. What a concept! Reality was a primary source. For him, the point of philosophy was not just to learn what other philosophers thought, but to figure out the nature of the world. And then he enriched his thought with the experience of his own spiritual life and the wisdom and mystery conveyed by the Gospels, growing into one of the most famous philosophers and theologians in the West. If you believe the world is a coherent place, and if you think humans should use their minds to the fullest to explore the complexities, ambiguities and mysteries of existence in all its messy glory, then you are ready for Aquinas. Thomas Aquinas was born into a noble family outside Naples in Italy around 1225. The fix was in for him to become the abbott of the Benedictine Abbey of Monte Cassino and there he spent is youth. War intervened, making the monastery an unsafe place to be, so he was packed off to the University of Naples, where he first studied the thought of Aristotle (considered dangerously secular by the Church of the time) and came to know that new and radical group of itinerant preachers called the Dominicans. He joined their order, rebelling against his family and scandalizing them so much that they kidnapped him for a year. But he escaped and made his way to France and the University of Paris. There he studied with scientist and theologian St. Albert the Great and later accompanied him to Cologne, Germany, where he taught and was ordained a priest. 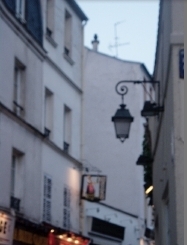 He returned to study and teach at the University of Paris, living on the Rue St. Jacques in the Left Bank's Latin Quarter. He spent the rest of his life studying and teaching in both Paris and various cities in Italy. While in Rome at the Church and Monastery of Santa Sabina on the Aventine Hill, he began his great work, the Summa Theologica, whose ideas we will soon be exploring. Aquinas both defended the legitimacy of science and the secular thought of the time and integrated them into the wider context of the wisdom and mystery of the Gospel message and theological tradition. He died in 1274 and in the years that followed his work narrowly avoided condemnation by the Church. Almost fifty years after his death he was canonized a saint and later made a Doctor of the Church. 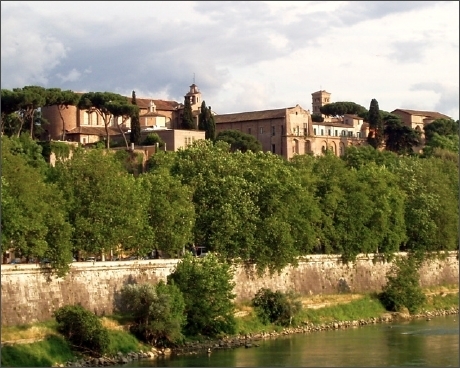 In Aquinas, the mind of an engineer and the soul of a mystic unite in a happy Italian heart. And now on to the puzzle of religion and logic, a topic Aquinas spent most of his life resolving. Church and monastery of Santa Sabina on the Aventine in Rome, where Aquinas started writing the Summa Theologica. 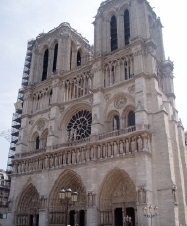 Notre Dame Cathedral, under construction in Aquinas's time as well. What medieval Paris might have looked like (minus the electricity and antennas). 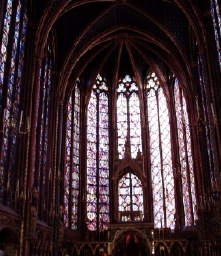 Sainte Chapelle, Paris, 13th century. All contents copyright (C) 2005-2011 The Jade Writers Group, Ltd. All rights reserved.